This paper explains what you need to do that will allow PCStage to control model RC servos. These servos can be controlled either by wire, or wirelessly using off-the-shelf model RC equipment. Control is not limited to servos: any device intended to be controlled by the standard RC servo signal may be controlled using this mechanism. The mechanism is based around a hardware interface device called the SC-8000 manufactured by Tom's RC. There are three models of interface controller available, more information on which one is required is listed below. The PCStage Plugin mechanism is used to enable PCStage to control the servos. The entire system is not terribly expensive, the SC-8000 interface is about $100 or $150 USD, depending on model, and a complete radio RC system will probably be less than $150, including a few servos. A computer upon which to run PCStage, obviously, which has a USB port. If you are going out to buy a complete wireless setup, then in addition to the SC-8000, I would recommend that you purchase a Futaba SkySport four channel RC pack, the exact contents of which pack seems to vary depending which country it is purchased from, but mine came with a R136F receiver and three S3003 servos, along with the T4YF transmitter. The SC-8000 can drive the Futaba transmitter to a full eight channels. When you order your SC-8000, make sure you order the appropriate transmitter cable, which for the specified Futaba transmitter is the Tom's part code RF5, the Futaba 9C square six pin. If you need a (much!) smaller receiver, I've found that the GWS 4 channel pico receivers to be useful. Tip - always use the same USB port for the SC-8000 (or in fact every device) every time, and if you use an external hub, then use the same external hub into the same USB port on the laptop or PC every time. When Xp discovers something has "moved" Xp isn't bright enough to understand its moved, it thinks its a whole new device, and installs it again on the port it finds it on. In the case of devices like the SC-8000 which are embedded serial ports, Xp gives it a whole new COMn number, and thus your software that was programmed to work on COM6 now needs to be changed to COM7. Depending on your juristiction, there will be specific frequency bands allocated for the use of model control, and within those allocations some may be more specific, for example aeronautical models only. It is advisable to get some local advice about what frequency bands you should obtain your equipment for, and it may make excellent sense to purchase locally. On the upside, your receiver(s) will be quite near the transmitters, so in a signal strength battle, you should win. ... INTENDED TO REPLACE ANY ASPECT OF NORMAL PERFORMANCE SAFETY WHICH IS EITHER REQUIRED OR MAKES GOOD SENSE WHEN DANGEROUS EQUIPMENT IS IN USE. MANUAL CONTROLS SUCH AS EMERGENCY STOPS, DEADMAN SWITCHES, CONFIRMATION ENABLE CONTROLS OR LIKE SAFETY DEVICES SHALL BE USED FOR MAXIMUM SAFETY. AUTOMATIC SAFETY DEVICES SUCH AS LIMIT SWITCHES, PROXIMITY SENSORS, GAS DETECTORS, INFRARED CAMERAS AND PRESSURE AND MOTION DETECTORS SHALL BE USED FOR MAXIMUM SAFETY. (MIDI) SHOW CONTROL IS NOT INTENDED TO TELL DANGEROUS EQUIPMENT WHEN IT IS SAFE TO GO: IT IS ONLY INTENDED TO SIGNAL WHAT IS DESIRED IF ALL CONDITIONS ARE ACCEPTABLE AND IDEAL FOR SAFE PERFORMANCE. ONLY PROPERLY DESIGNED SAFETY SYSTEMS AND TRAINED SAFETY PERSONNEL CAN ESTABLISH IF CONDITIONS ARE ACCEPTABLE AND IDEAL AT ANY TIME. Obviously, one needs to have PCStage installed, any version 4.0 or later will be fine. Prior to setting up PCStage to operate with the SC-8000, use the software downloadable from Tom's RC to prove that the interface works, that you can waggle the sliders on the software and the servos move. If Tom's software wont control the servos, then the PCStage stuff wont be able to either. Note which serial port the SC-8000 uses, you'll need that later. Download the PCStage SC-8000 driver plugin ttisc8.dll (387K, usual drill, right click, save as) and place this file in your PCStage plugins directory, along with your other plugins. Download the generic SC-8000 driver ttisc8if.dll (20K) and place this in your PCStage directory, not in the plugins directory! The SC-8000 plugin is both inviisble and silent, it is communicated with entirely through Plugin (PLG:) commnds. With your productin open, click on the plugins menu and then click on the ttssc8 item, the menu will vanish and absolutely nothing will appear to happen, but the plugin is now loaded. Now go into Production/Settings... and if you have a Plugins: field then click on the button next to it, and tick the ttisc8 item. This will ensure that the plugin is loaded every time this production is loaded. This feature appeared in PCStage version 4.6.something, so if you are running something earlier, you wont have this feature. The first command that needs to be issued is an Open command. For my shows I tend to have a cue-list item on the Default desk that brings the production to a known start point. 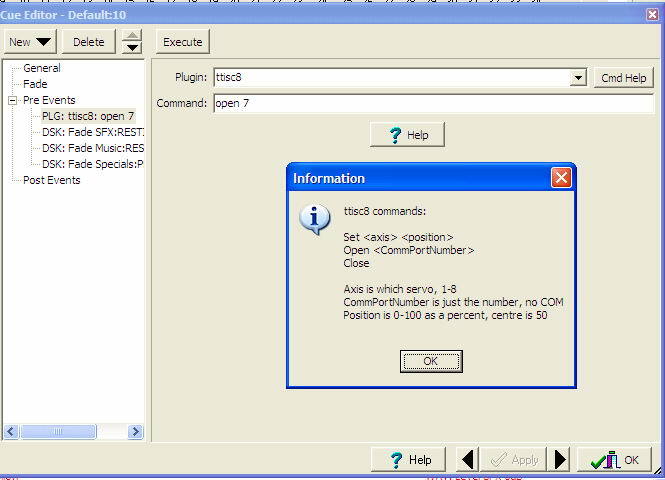 This is the cue that is shown in the screenshot above, and as can be seen it sets several desks to their start point, and issues the Open command to the SC-8000 plugin. This command can be issued more than once, and an error is returned if one does so, but it is not harmful. Although there is a Close command, it doesn't need to be explicitly used, when PCStage exits the plugins also exit, and the SC-8000 plugin will politely do the close itself. The only other command is the Set command. It is the Set command that moves servos. The syntax is explained on the help screen as shown above, and can be seen in action below. In the (deep breath) Farndale Avenue Housing Estate Townswomen's Guild Dramatic Society Murder Mystery there is what is almost a preshow piece in the theme park sense, a film show. The character Thelma operates the projector which is out in the auditorium projecting a very out-of-focus image onto a screen, whilst Mrs Reece on-stage comments on what we are watching, though they are not quite on the same page, but thats Farndale for you, but its all irrelevant as the image is so out-of-focus that nothing can be made out. ...I was over there a few years ago for their Jubilee or whatever it was, and one never knew - There's a Manx cat! Oh, it's gone. But there are the scratch marks on Mr Beasley's leg. Isn't that wonderful? Was that meant to happen? The film suddenly breaks? On cue?? How do you do that??? Yes, thats an Elmo 16mm movie projector, with an added (non-Elmo) slasher attachment. This is a picture taken during development, the tie-wrapped on blade was replaced with a single sided razor blade, screwed to the servo arm. The blade only works once, so it needs changing every show. 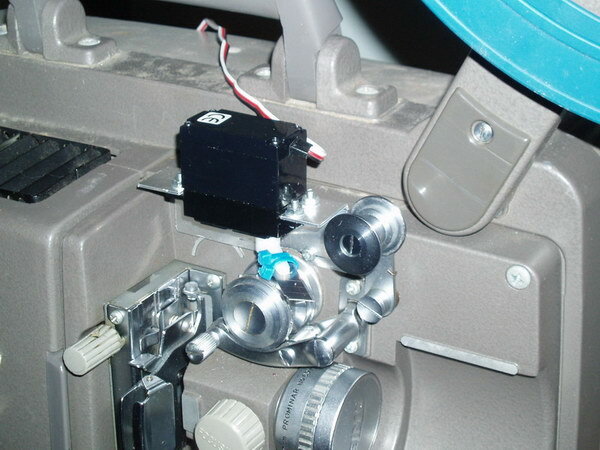 The command that controls the cutter is PLG:ttisc8, sending to servo number 2, and the postions were 80% whilst resting and 22% buried the knife deep into the film path. The two cues concerning the chopper (numbers 150 and 160) had one follow on from the other ("next") half a second apart. Thus a quick slashing action. Cue 165 has the comment "switch projector off". The projector received power from a relay box controlled by DMX512. For the purposes of neatness, I used a separate desk for the relay box devices, to keep matters simple. Using desk commands (DSK:), one desk can control another. The actress herself was supposed to switch the projector off herself, but if for any reason this didnt happen then this cue ceased the projector power, so it definitely went off. There are two easy modifications that can be made to the transmitter to make it more useful with the SC-8000 and PCStage. Either of these modifications will of course invalidate your waranty on the transmitter. I've left the detail deliberately vague, anyone competent to make the mods will be easily able to work out what to do from the info provided. The SC-8000 injects its signals through the trainer port on the back of the transmitter, and is only active when the training switch is held forward. The training switch is spring-loaded to flip off as soon as you let go of it. By swapping the switch for an ordinary latching toggle switch, the trainer mode will stay engaged, allowing long-term operation without either holding the switch or resorting to rubber bands or gaffer tape or somesuch. The Futaba T4YF transmitter can be ordered with rechargeable batteries, and to enable the batteries to be recharged the transmitter has a power socket on the side. The same physical transmitter is used for both versions, so you get the jack socket whether you have the rechargeable transmitter or the non-rechargeable tranbsmitter. The way it works is that the batteries are connected to the centre pin of the power switch. When the switch is turned on the batteries are connected to the transmitter electronics, and when the switch is turned off the batteries are connected to the power jack via a reverse polarity protection diode. By cutting the PCB tracks and swapping the battery and transmitter power connectors to the switch round, the transmitter will run off the ordinary batteries in the on position, but when switched off will operate on power supplied from a wall wart adapter. The receivers noted above do not have a voltage swing sufficient to drive a PIC input pin directly, which is a massive shame. It took me a while to figure this out... However a standard 74 series device can be used as a voltage receiver. Company website (and presumably the company!) vanished. Long and custom made servo cables can be ordered from Ashtek Electronics, who are located in the UK but ship worldwide. The 436 Model Shop based in New Zealand, will ship worldwide, and thats where I purchased the Futaba kit from. Another New Zealand company, Foamworks supply all sorts of odd RC related items, including the tiny GWS receivers mentioned above, and also ship worldwide. More information on my replacement driver for the driver supplied by Tom's RC. You can contact the author by using this contact form.